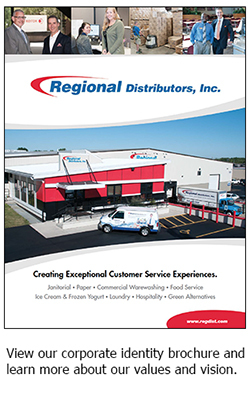 Regional Distributors, Inc. is one of the largest and fastest growing distributors of commercial paper, packaging, janitorial, warewashing, laundry and hospitality, food service, ice cream, frozen yogurt, and green products in Western New York. 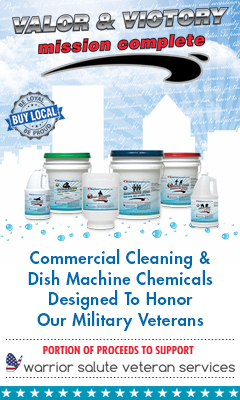 Since beginning in 1994, our local family-owned, NYS Certified woman-owned business has been led by one clear goal – to provide our customers the convenience and value of “The Total Package” – a one-stop source for commercial cleaning, food service, and green products to streamline your supply needs adding more growth, success, and value to your business. From the time our first trucks rolled out, we have embraced the latest technologies and distribution systems that have allowed us to grow flawlessly while providing our customers the most efficient, reliable, and expedited service. Our innovative and enthusiastic drive to provide quality products, effective solutions, and exceptional customer service has made us a trusted, value-added partner to over 2,500 customers including Abbott's Frozen Custard, Zweigle’s, Rochester Institute of Technology, University of Rochester Medical Center, Paychex, Pontillo's Pizza, Finger Lakes Coffee Roasters, Xerox Tower, and many other corporate, institutional, and independent businesses. We deliver not only a diverse variety of quality products from over 150 leading suppliers, we create exceptional customer service experiences by demonstrating our core principles and values in everything we do and focusing our cumulative knowledge to create customized product and program recommendations to support the growth of businesses from a range of markets. Our team of experts have been commended by customers on numerous occasions for providing valuable in-depth assessments and recommending efficient products and quantities that reduce costs, labor, and resources. Our dedication to our customers' success also extends to customized one-on-one product and equipment training, expert preventative maintenance services, industry insights, and attentive and flexible accessibility to support each of our customer's unique business needs. There is power in numbers and Regional Distributors, Inc. is a respected and proud partner to several prominent affiliations that are renowned and respected within their respective industry. Our strategic partnership with the following national organizations allows us to deliver the superior services, products, and values our customers demand and deserve. Regional Distributors, Inc. is a NYS certified Women’s Business Enterprise approved by the Empire State Development Division of Minority and Women’s Business Development (DMWBD). WBE certification validates that a business is at least 51 percent owned, controlled, operated, and managed by a woman or women. As a certified women-owned business enterprise, Regional Distributors, Inc. is proud to promote equality of economic opportunities, eliminate barriers to minority and women participation in state contracts, and support New York State’s economy with increased access to opportunities for minority and women-owned businesses. To deliver our customers competitive pricing, Regional Distributors, Inc. is a proud member-owner of Strategic Market Alliance (SMA), an interdependent cooperative buying group owned and directed by the nation’s leading janitorial and food service distributors who cover every major market in the U.S. and leverage a collective purchasing power over $4 billion in annual sales. SMA is also a proud supply partner with all of the leading market manufacturers including Dart/Solo Cup, SCA Tork Tissue & Towel, Pactiv, Kimberly-Clark, Georgia-Pacific, Fabri-Kal, Betco, GOJO, and many other leading suppliers. It is the commitment of SMA owners to optimize the effectiveness of their chosen supplier partners while providing current and future customers a more efficient, sustainable channel partner. SMA is structured to enable suppliers and distributors to work more proactively together to address channel issues and grow sales to generate greater returns. SMA members also strive to optimize efficiency and effectiveness within the supply channel by creating value-based, functional and sustainable business solutions that improve operations while enhancing customer satisfaction. In 2009, Strategic Market Alliance (SMA) distributor owner members, including Regional Distributors, Inc., committed to developing a formalized health care program focused on meeting health care’s most important needs – service and education. After much research and development, SMA launched their health care program HealthRite that assists Regional Distributors, Inc. and other SMA members in delivering the proper products, services, and solutions to the health care industry. SMA is a proud partner to numerous GPOs including Prime Services, Novation, Navigator, 1Government Procurement Alliance (1GPA), MedAssets, and Building Service Contractors Association International (BSCAI), giving us the ability to utilize extremely competitive contract pricing for our customers. Through HealthRite, all SMA distributors assign health care specialists to remain current on health care issues and concerns, as well as serve as a conduit between distribution and SMA on all industry related matters. All SMA health care specialists are experienced in servicing the health care industry and maintain memberships in APIC and ASHES. HealthRite has been well received by the nation’s largest GPOs, including Premier, Inc. and CPS Care Purchasing, as well as the industry’s key manufacturers. As a result of this commitment to health care, SMA recently became an approved housekeeping distributor for both Novation and MedAssets. With growing health care costs, GPOs have become an important source for health care facilities to increase efficiency and contain costs. Regional Distributors, Inc. is a proud supplier of leading GPOs including Premier, Prime Services, Novation, Navigator, 1Government Procurement Alliance (1GPA), MedAssets, and Building Service Contractors Association International (BSCAI). Our participation with leading GPOs allows us to conveniently and easily service our health care customers by delivering quality products at efficiently control costs. "I’ve had the pleasure of working with Regional Distributors, Inc. for the past 13 years and have experienced outstanding outcomes. Their team goes above the rest to know business trends and buying opportunities that will benefit their customers. They are extremely innovative when recommending the best solutions for my needs, while always upholding my high quality standards. They consistently supply excellent order accuracy and customer service and always take a genuine approach to solving business concerns and cost savings. I have gained more success from their guidance than I have from attending seminars and trade shows, and I truly appreciate their genuine dedication to our success."